This help guide also covers features that are only available in the Pro Version of Qusq Pro. If you're interested in upgrading to pro, click here to learn more about the new features. Qusq Pro has many more customization options including typographic selectors, stylistic color pickers and other add-ons. And in addition to these fantastic features, you'll also receive dashboard one-click updates and access to world-class theme support by our team of in-house professional WordPress developers. Please note that support is only offered for Qusq Pro. If you already have a Pro license and have any questions that are beyond the scope of this document, feel free to ask us via our dedicated help center. If you're looking for WordPress theme installation and setup to look exactly like the live theme demo and do not feel comfortable to go through all the steps below - then we're here to help. Fast & simple for only $89. Our in-house team of professional developers will install the theme, upload the demo XML file, and setup your website exactly like the live demo. Frustration free. Complete your purchase of the Theme Setup service by clicking the link above and send us the details below. If you haven't yet done so, please download and install the latest WordPress version on your server from wordpress.org. If you haven't worked with WordPress before, check these tutorials in order to learn at least the minimum WordPress basics. 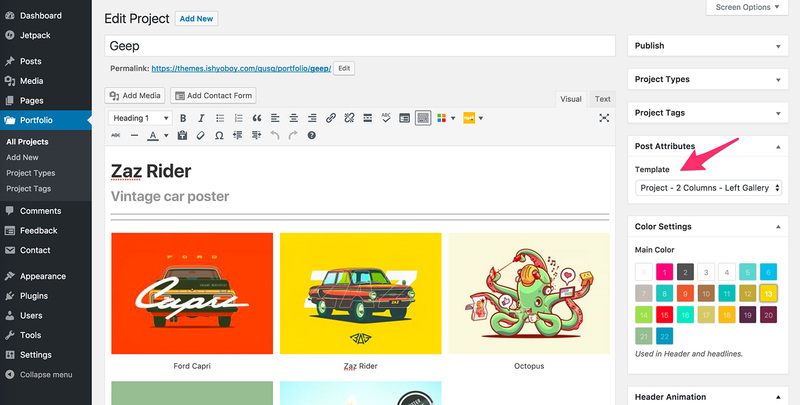 To upload the theme, through your WordPress Dashboard select Appearance > Themes . Next, click the “Add New” button at the top of the page and then click the “Upload Theme” button, right next to the main headline. Please ensure you are uploading the theme .zip file, not the entire package you downloaded. In this case, you will be uploading qusq-pro.zip file. Choose it and hit the “Install Now” button. Once the theme is uploaded and installed, click “Activate” to activate it. In case of Error "Are you sure you want to do this?" It means you have an upload file size limit and you should either install the theme via FTP (see next step), or call your hosting company and ask them to increase the limit. Provide the following information: upload_max_filesize and post_max_size and ask them to set it to 40MB. To manually upload your new WordPress theme, login with your credentials to your website and locate the wp-content folder in your WordPress install files. First un-zip the qusq-pro.zip file, then upload the un-zipped qusq-pro folder into the wp-content/themes folder. Once uploaded, activate the theme by heading to the Appearance > Themes menu in the WordPress Dashboard. Locate the Qusq Pro theme and hit Activate. To be able to use the full potential of Qusq theme there is a set of plugins the theme was made specifically to work with. After the theme is activated in the WordPress administration area, you will see a notification containing all recommended plugins. Go ahead and Begin Installing them. If the notification is not visible, simply navigate to Appearance -> Install Plugins to see the complete list. It is up to you to decide which plugins you want to use. To install all plugins at one or just some of them, tick the checkbox before each of them and from the "Bulk Actions" dropdown select Install and the hit the Apply button. WordPress Importer - Imports demo content - posts, pages, images, navigation, etc..
Customizer Export/Import - imports customizer settings used in our live demo page. Widget Importer & Exporter - imports the widgets used in our live demo page. You can also manually download & install our free optional plugin to enhance your website with a set of shortcodes, like buttons, icons, toggles, accordions... IshYoBoy Shortcodes Plugin - A small set of shortcodes for better content handling. The installation of external plugins, is done via Plugins > Add New > Upload Plugin and uploading the downloaded plugin's .zip file. Qusq Pro allows you to turn your website into advanced ecommerce shop by ensuring 100% compatibility with the free WooCommerce Plugin. The plugin is not included and needs to be installed separately from the official WordPress plugin repository. You can download & install WooCommerce Plugin by navigating to Plugins > Add New in WordPress administration and using the search field to look for woocommerce. Then simply Install and activate the plugin. To import the demo content, the WordPress Importer plugin must be installed & active. 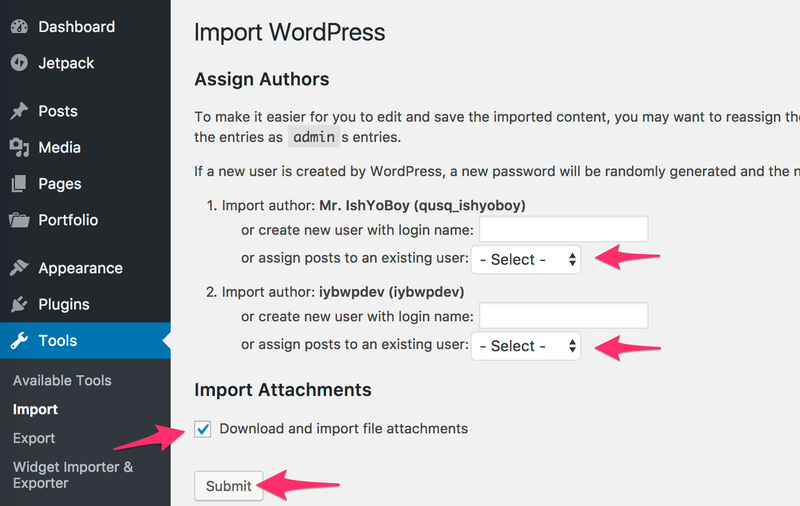 Head to your WordPress Administration and open Tools -> Import -> WordPress section and hit the "Run Importer" below it. Within the package contents, inside the Demo Content folder, you'll find qusq-pro-content.xml file. This file contains the live demo's content (Pages, Posts, Portfolio Items, Navigation Menus, etc..). All essential plugins such as JetPack, importer plugins, etc.. must be active before the import, otherwise some data may not be imported. Choose the qusq-pro-content.xml file and hit the "Upload file & import" button. Make sure to check the import attachments options, so all images and files are imported too. You can then choose to assign all posts to an existing user from the drop-down menu and hit Submit. To import customizer settings, the Customizer Export/Import plugin must be installed & active. Head to your theme Customizer Appearance > Customize and look for the Export/Import section. Within the package contents, inside the Demo Content folder, you'll find qusq-pro-customizer.dat file. Upload that file with the uploader within that section and hit Import. To import widgets, the Widget Importer & Exporter plugin must be installed & active. Head to your WordPress Administration and open Tools -> Widget Importer & Exporter section. Within the package contents, inside the Demo Content folder, you'll find qusq-pro-widgets.wie file. Upload that file with the uploader within that section and hit Import Widgets. 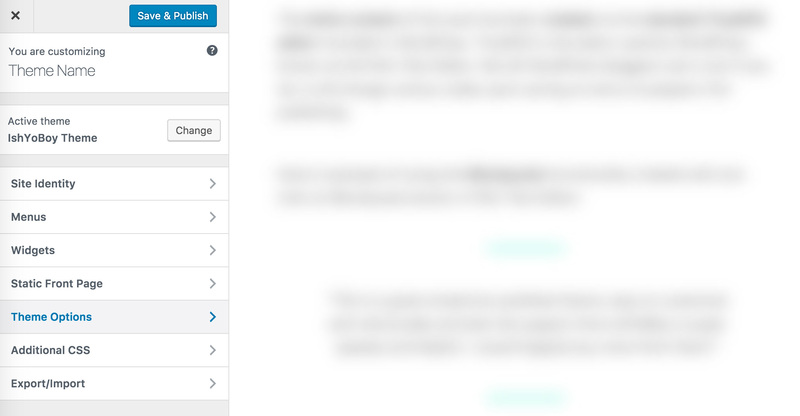 By default WordPress adds an initial set of widgets. The imported widgets will be added after these. To remove them, before importing the ones from the live demo, navigate to WordPress Administration, "Appearance > Widgets" and removed them from the "Sidebar" one by one. 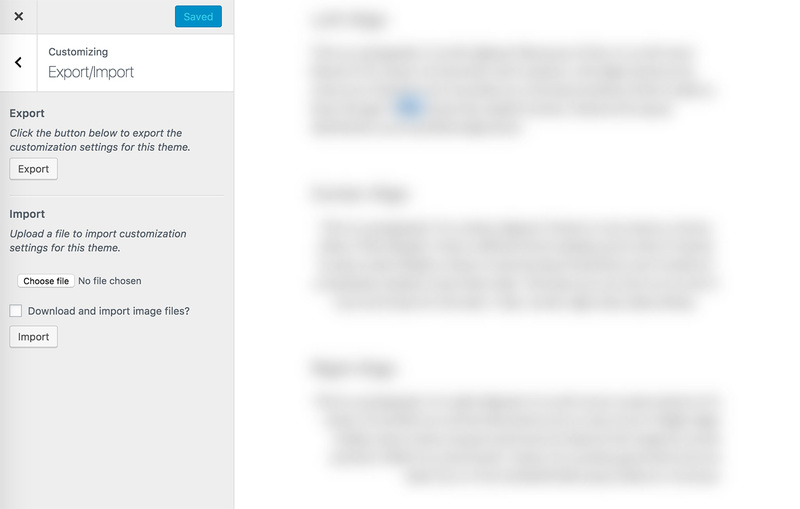 It is rather important to set your theme menu in the WordPress Dashboard. 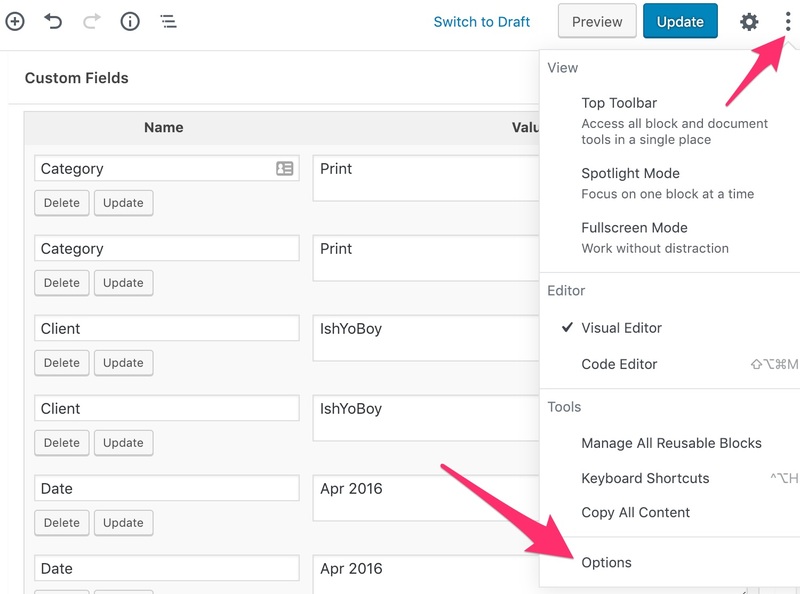 To do this, locate the Menu options by selecting the Appearance -> Menus in WordPress administration. Failing to create a WordPress Navigation Menu and attaching to a location will list all your existing pages in the navigation without allowing you to edit it. Qusq supports 2 menu locations, "Primary" and "Social Links", and they both need to have Navigation Menus attached to them. To assign a menu from the menus imported in the previous steps, choose "Main Navigation" from the drop-down list and hit the "Select" button. You can add it to the "Primary" menu location via the Menu Settings, below the Menu Structure area. To create a new menu and assign it to a location first click the create a new menu link, choose a name for it and hit the "Create Menu" button. The menu will be automatically selected for editing. 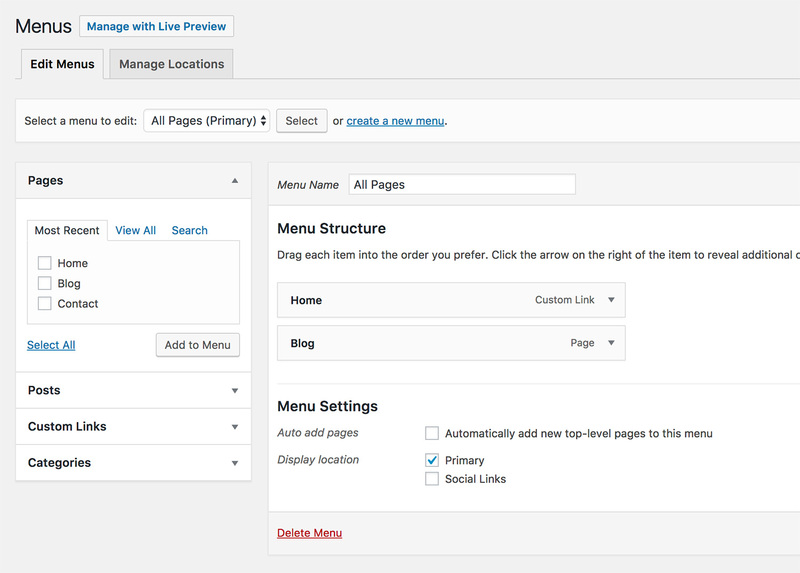 Add pages and links to the menu you just created in the Menu Structure area. You can add it to a menu location via the Menu Settings, below the Menu Structure area. The Social Links Menu is populated in both the site footer and the side navigation area of the theme. 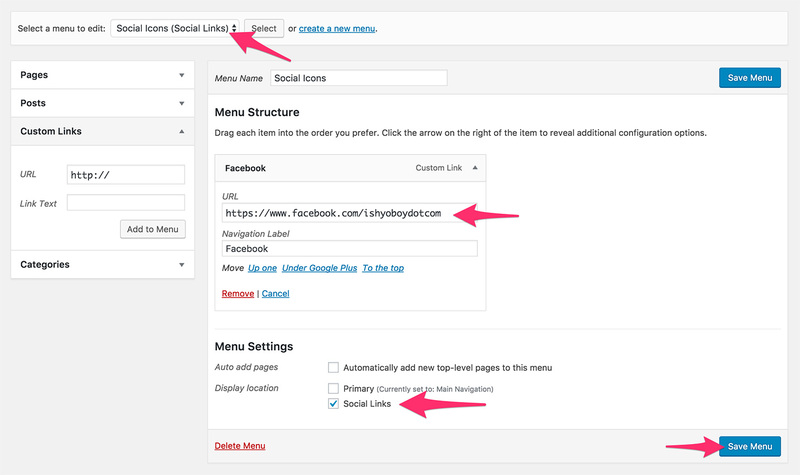 Make sure you have created a menu, selected it for editing and successfully attached it to the "Social Links" location. To add the icons, simply create a custom link to the social media and Qusq Pro will take care of the rest based on the URL of the media. Social Links Menu in the "side navigation" area. Social Links Menu in the footer area. Usually users use a static page for a front page (or "home") and the blog is set to be displayed on a separate page. WordPress however, displays the latest posts on the front page ("home") and there is no specific "Blog" section by default. To change this setting and to match the setting on our live preview head out to Settings > Reading section from WordPress Administration area. Once there, select the A static page (select below) radio option. For the "Front page:" option choose "Home" and for the "Posts page:" choose the "Blog" page. Hit the "Save Changes" button and you are ready! If you do not have the pages yet, simply create empty pages and come back to set the settings mentioned above. To access the live Customizer, you may select the Customize button in the admin bar dropdown or select "Appearance > Customize" from the Dashboard menu. Note that you must be logged in as a site administrator in order to access the controls. All theme options are grouped under the "Theme Options" tab within the customizer. Apart from them, you can edit and modify all standard WordPress Customizer options. Please take your time to explore all options under "Theme Options" section as this is where you can modify all Colors, Portfolio options, Blog settings, etc.. These were all necessary steps to import & setup your theme as it is on our live preview server. Now you can start updating all the content to your needs. The sections below will help you better understand how the theme works and what is necessary to do in order to have all theme parts work correctly. Make sure to check the Advance Header Titles, as this is an essential feature of Qusq theme. Qusq Pro has the following templates built into the theme and can be applied by creating and saving a page in WordPress. One of the unique Qusq features is the ability to customize the header area of every single page and post and make it visually attractive. This allows you to not only have a Title but a Sub-title, additional text block and even choose the background colors and animation. By default Qusq will output the page/post's Title in the header area. If you want to add additional sub-title and content or simply highlight some of the words the following steps need to be followed. 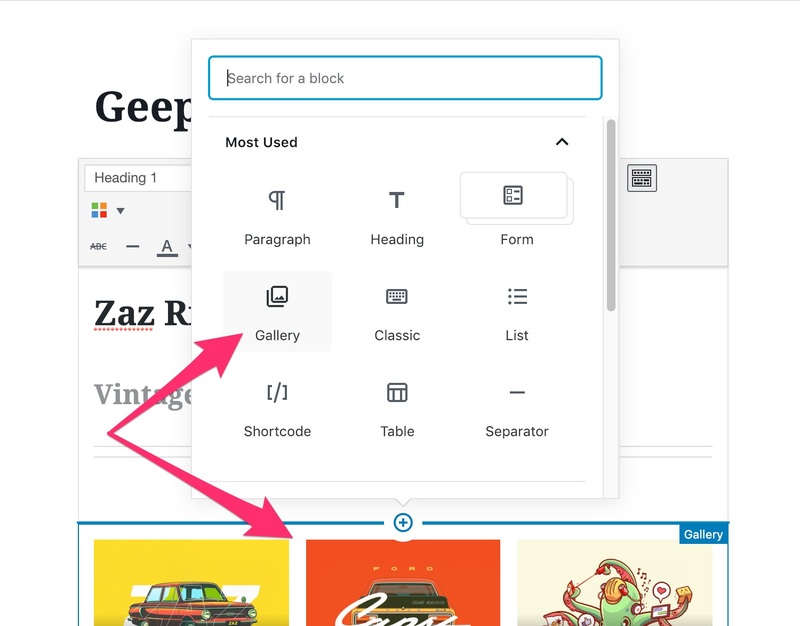 If using Gutenberg content editor which was introduced in WordPress 5.0, you need to add a "Classic" block as the first block of your content. Once the Classic block is added to the content, use it only to customise headers. All the remaining content can be added in separate blocks and it does not have to be inside the "Classic" block. You need to add a "Heading 1", optionally a "Heading 2" and optionally a paragraph of text as the first thing into the content area. In this case the Title of the page/post will not be used. Once done, those need to be immediately followed by two horizontal lines. To highlight specific words, or parts of the text you can use the built-in content highlighter. If you do not want any specific color, simply use the first, colorless, option which will highlight the words based on the currently selected colors. This will result in a beautiful and unique custom headers that will make your website one of a kind. To make the posts and pages more colorful, you can use the "Color Settings" box on the right-hand side of the edit screen to pick the right color for the given post or page. The color will be used as a background for the Header area and all headlines within the page/post will be set to this color by default. To make the header area even more interesting there is an option to use automatic color transition from one color to another. Simply tick the option in the "Header Animation" box and Qusq will take care of the rest. Creating a new Page is a standard WordPress feature. If you are not familiar with how to do it, please make sure to re-check the basics of working with WordPress. See the list of links in WordPress Installation section. All pages support Qusq's "Advanced Header Titles" feature as well as "Header Colors" and "Header Color Animation" as explained in the Advance Header Titles section. You can chose from one of the three content overlay templates to control how much the content will be overlapping the header section when scrolling. This comes specifically in handy when the Page starts with an image, title or a regular paragraph of text. To see all available templates within the theme please navigate to the Templates section. 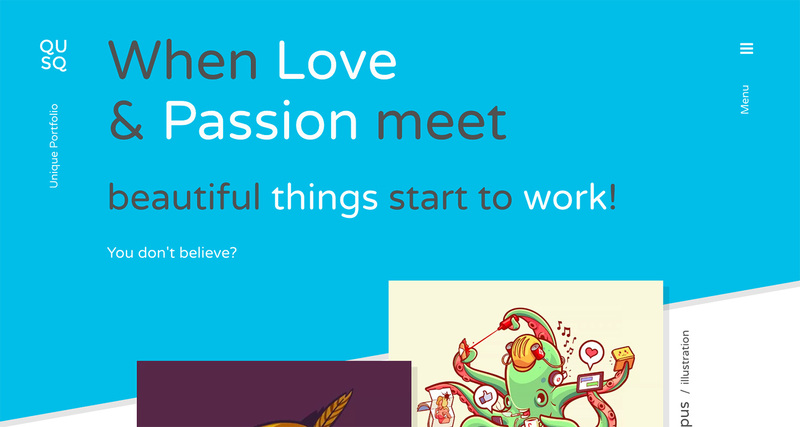 Qusq Pro comes with a beautiful parallax scrolling portfolio to help you display your Projects in a very sleek, colorful and interesting way. To enable the Portfolio functionality make sure the JetPack by WordPress.com plugin is installed and active. Once you've successfully activated the plugin, you should see a Portfolio tab in your WordPress Dashboard Sidebar. 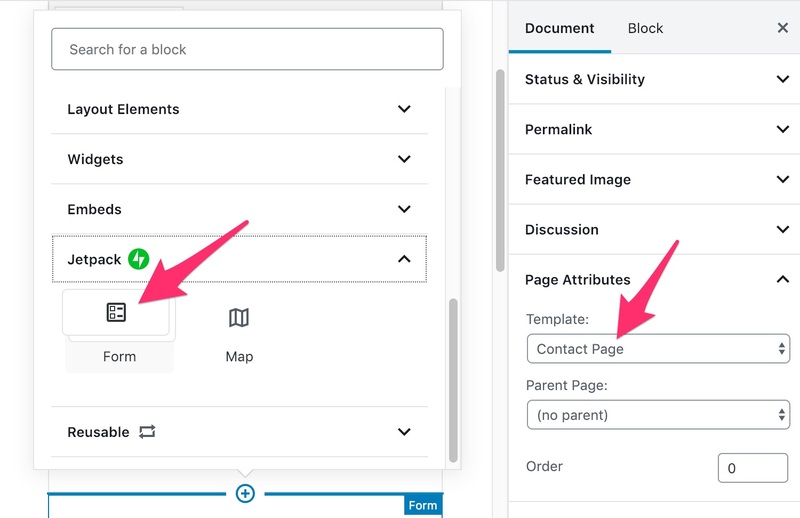 If it is not there, navigate to Jetpack -> Settings, enter the Writing tab and scroll down to Custom content types section and make sure the "Portfolios" setting is enabled. Creating portfolio posts is done exactly the same as standard posts. 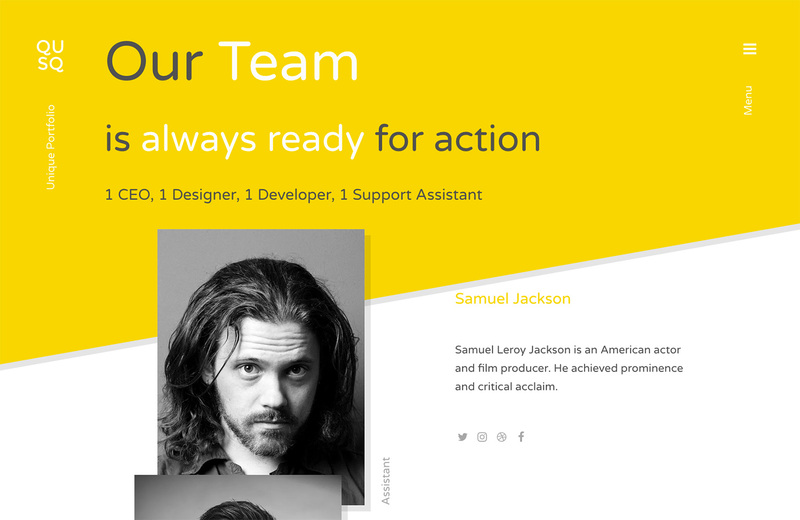 In addition, three portfolio templates are supported to define the layout of each project. To select the right template, edit an existing or create a new portfolio project and from the right-hand side column, in "Post Attributes" box pick the one that fits most. You need to create a new page and ensure its slug is "portfolio". That is it. Qusq will take care of the rest. Upload a featured image - any size will work. The images will be automatically applied throughout all the necessary templates and loops. To add a gallery to a portfolio project, simply add it to the content editor using the "Add Media" button or as "Gallery" block if using Gutenberg editor. No matter where it is placed within the post and what layout is chosen, Qusq will automatically take the first regular WordPress gallery and transform it to a one that fits the chosen Project Template layout (Left, Right or Default). By default Qusq will output only the post's Title in the header area. If you want to add additional sub-title and content please see the Customizing Headers section. There is no specific page representing the whole portfolio as this is dynamically generated content. The only way to control the header title and sub-title in this case is by creating a page with a "portfolio" slug and setting the headers in it. If you manually change the portfolio slug in the customizer's "Theme Options" area, please make sure the page for the headers will also have the same "slug". To make the post detail pages colorful, you can use the theme's header coloring feature for each post. Check the Header Colors section for more details. To make the header area even more interesting there is an option to use automatic color transition. 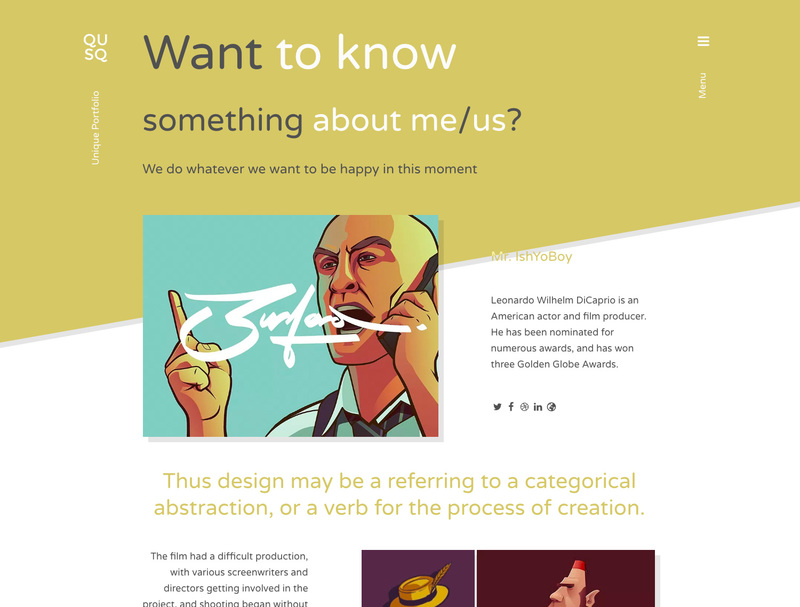 Check the Header Colors Animation section for more details. Each portfolio post supports the standard WordPress Custom Fields. To enable them in the edit screen click on the menu in the right top corner, click on "Options" and make sure the "Custom Fields" checkbox is ticked. You can add any amount of "Name - Value" pairs depending on what your project needs. These fields will be automatically output under the content of the post in an ordered list with the Names highlighted in the post's color.. Located within Appearance > Customize > Theme Options, you will find a "Portfolio" section. Here you may tweak the Portfolio's behavior and options. The Blog is an essential WordPress functionality. The posts can be either displayed on the homepage or on a specific page based on the setting under Appearance > Customize inside "Static Front Page" section in WordPress Administration. If the latest posts are displayed on the homepage, there is no specific page representing it as this is dynamically generated content. The only way to control the header title and sub-title in this case is by creating a page named "Blog" with a "blog" slug and setting the headers in it. The theme provides a few options which define how the blog posts will be displayed. Please navigate to "Appearance > Custopmize > Theme Options" located in the WordPress administration and open the "Blog" tab to see all available settings. The creation of a blog post is a standard WordPress feature so there is nothing special about it. The only unique aspect is setting the color & titles as explained in Header Titles section. Only available in the Qusq Pro version. Qusq Pro has a built-in Team overview functionality. This feature is specifically useful for small teams wanting to present their members with some small info and details about each team member. 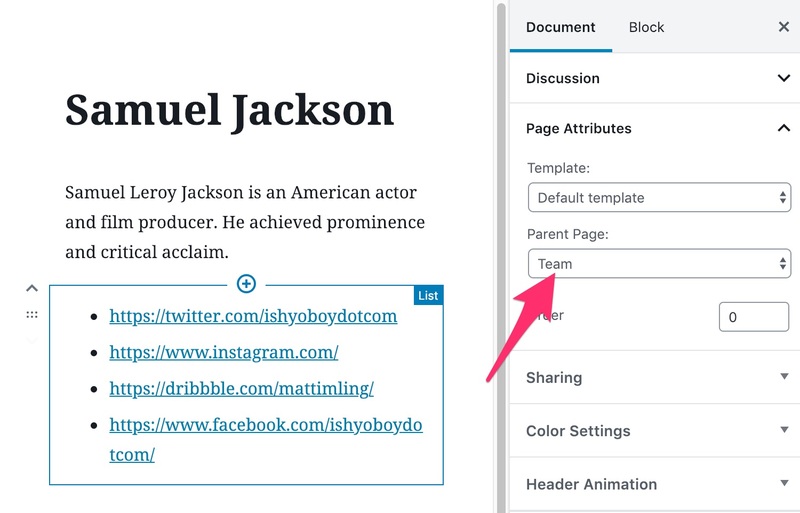 You need to create a new page, edit it and set its template to be "Team Page". When this is done, this page will display all team members. Now we just need to create each member. 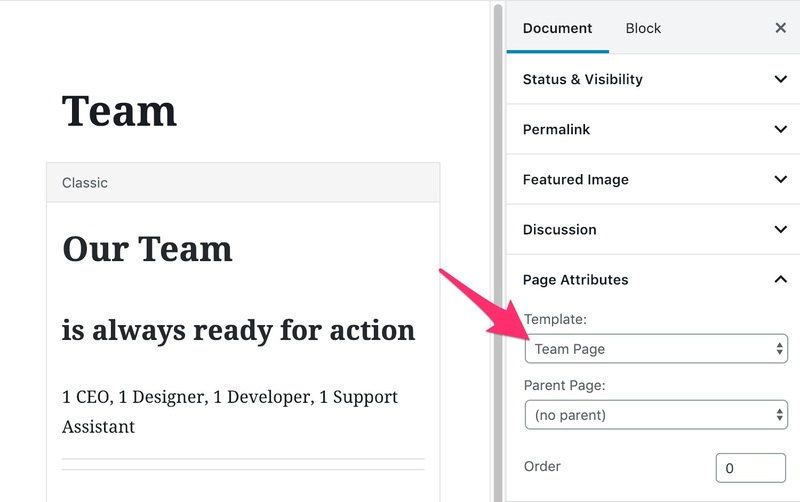 Team members are regular WordPress Pages with the only difference that their "Parent Page" needs to be set to be the "Team" page you've just created in the previous step. Attention, the "Team Page" template should not be set for team members pages. Page Title - The name of the team member. Featured Image - The team member photo. Featured Image Caption - The team member position displayed next to the photo. Page Content - Short description about the member. Unordered List of social links - (optional) Social links. To create a list of Social Links which will be transformed into Social Icons linking to the given links we first need to create a "List" block by clicking on the button in the visual editor and then entering the URLs, but ensuring they are transformed into links by clicking on the "Link" icon in the visual editor. To let WordPress transform these links into social icons, one more step is necessary. 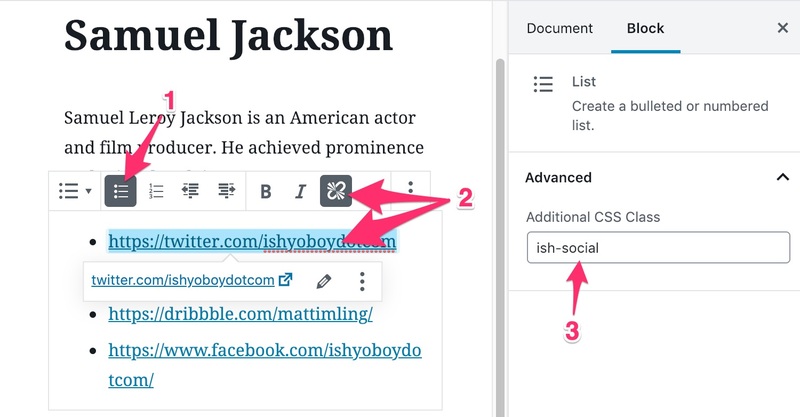 Please open the "Advanced" tab in the right hand side column and add ish-social to the "Additional CSS Class" field. That's it. All links will now be transformed if they can be found in the list of supported icons. To set up the Contact page, simply create a page using one of the "Contact Page" or "Contact Page - Map" templates and publish it. Qusq will automatically extract the contact forms from the content and place them in the right place inside the template. Qusq supports either the Contact Form provided by JetPack WordPress Plugin or forms created using the Contact Form 7 WordPress Plugin. If you want to use JetPack's one, simply edit the page and add "Jetpack Form" block. Once done you can edit it directly from within the content. 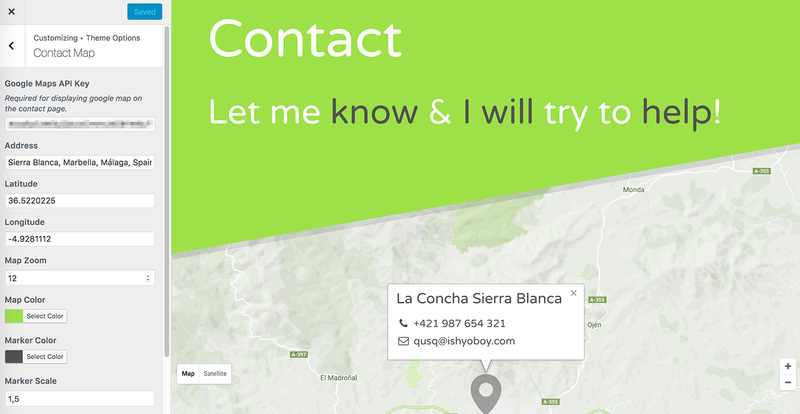 If you choose to use the contact form with a Map you need to set it up by navigating into the Customizer section. Under "Appearance > Customize > Theme Options > Contact Map" section you will find all necessary fields to set up your map correctly. The "Marker description" is a free HTML area, where you can put the text that will be displayed once the marker in the map is clicked. 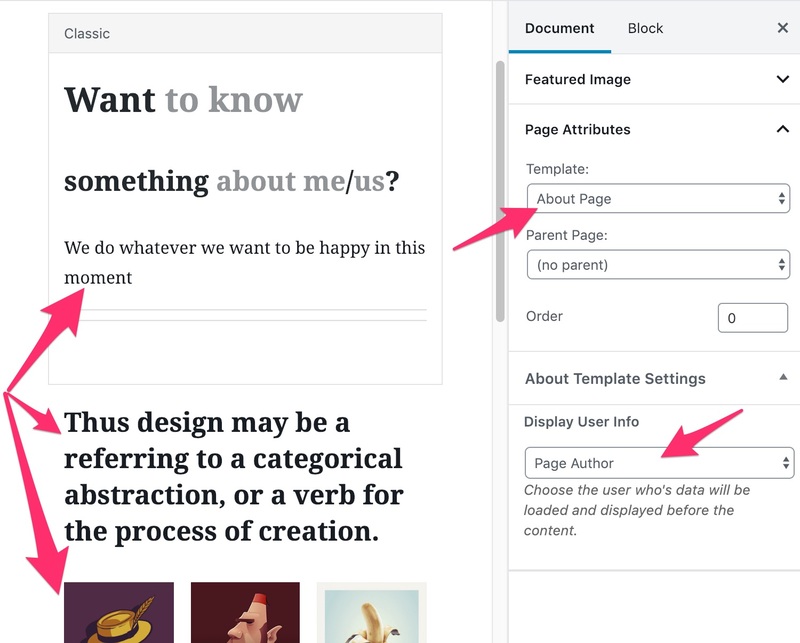 If you set the "About Page" page template to any page, it will allow you to automatically pull the info of a WordPress user and display it. You first need to save the page, so that the additional boxes, specific to this template, will be enabled. 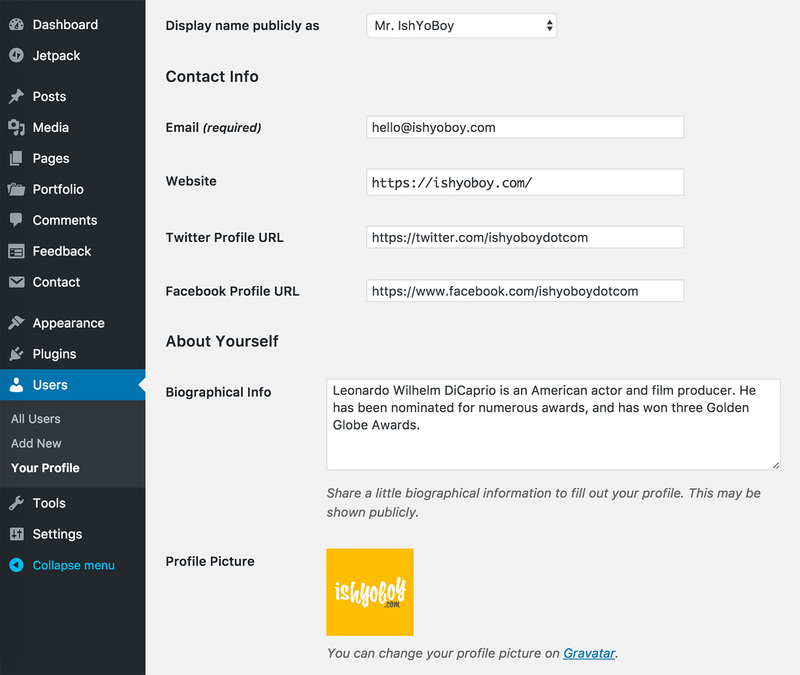 Once saved, the template will allow you to chose which user's details will be pulled. It will load the user's display name, description and social links if entered in the user's details in WordPress administration area. To edit the details simply navigate to Users and edit the user you need. If a featured image is set for the "About Page", it will override the user's avatar set in their settings. This will allow you to upload higher quality photo. Moreover the first headline within the content will be displayed in full-width. The first gallery in the content will be displayed in a right column and the remaining text will be displayed in a lef column. Too see the final result, please check the About Page on our live demo. To provide you with a set of useful elements like buttons, icons, tabs, toggles, etc..., Qusq is compatible with our free IshYoBoy Shortcodes Plugin. You can download and activate it to extend the default set of content elements. Once element selected from the dropdown menu it will enter a shortcode into the content. The shortcode consists of an opening tag, closing tag and attributes which can be changes. E.g. url - enter the URL of the page to be opened. E.g. : "http://ishyoboy.com"
content - "Button Text" - the text in the button. Always make sure the shortcodes are correctly nested and closed [tag] ... [/tag] as failing to do so will generate errors and will break your page content. width - the width of columns on screens bigger or equal to 768px unless other sizes specified. All columns are automatically transformed to full-width on phones by default, to keep a clean and consistent design. In the example above the columns will be full-width on phones. From Tablet size (768px) they will be transformed to 2 columns per row. From laptop size (1024px) of the screen, there will be 3 columns per row and on big, desktop screens (1200px and more) there will be 6 columns in a row. To provide you with an option to change fonts, Qusq is fully compatible with free plugin Easy Google Fonts. It provides you an option to change all fonts across the Qusq theme. The basic settings allows you to change fonts for "body, paragraph, headlines (h1-h6)". To give you the ability to have your website in multiple languages, we Qusq ensures compatibility with the free qTranslate X Plugin. Qusq Pro has a built in update checker, so whenever we release a new update or fixes, you will be notified right away in your WordPress Administration area. Always backup the theme before deleting or updating it, to avoid losing any modifications. To simplify the update process, if you have purchased the theme from our IshYoBoy.com shop, you can enter the obtained unique License Key and you will allow WordPress to do the update automatically without you having to do everything manually. All this directly from the WordPress Administration area. Don't have a valid IshYoBoy.com License? If you have purchased the theme from another marketplace such as ThemeForest, Creative Market, MojoMarketplace, etc.. You can easily convert it to IshYoBoy.com license and use it. To update the theme using WordPress administration, activate a different theme in Appearance > Themes, delete the current Qusq Pro theme and upload the newest version the same way as you first installed the theme. Once done, activate the theme and it's done. 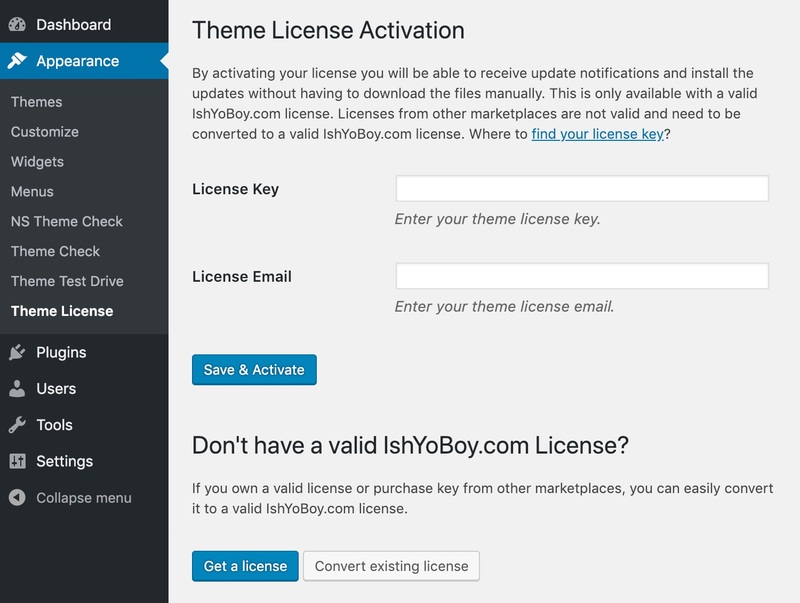 If you have an active license key from IshYoBoy.com applied to your theme, you will receive live update notifications to which allows one-click updates directly from your WordPress dashboard. Overall, the safest way to update your theme is to back-up your current theme folder and update the theme directly through WordPress administration with activated license. If something has gone wrong with the new version, you're just a few clicks away from getting things back to how they originally were by removing the new theme version folder and replacing it with the backed up one. Please note that IshYoBoy is not responsible for content loss, database errors and such, which may happen to your WordPress install upon an incorrectly applied theme update. Once you've located your license key on your purchase receipt, you may enter it by navigating to Appearance > Theme License in WordPress administration area. Once your license key and email used during the purchase are entered, hit the "Save & Activate" button and your license will be automatically activated. Upon a successful activation you'll see a green “License key is active” notification. Please note that licenses are only given for Qusq Pro - not the free version. It is important to keep your license up to date in order to continue getting updates for your IshYoBoy WordPress theme and support for any issues you may encounter. Renewing your license grants you access to support and updates for a year, including all updates for bug fixes and feature introductions. License keys may be renewed at on our website. You will get a renewal notification if your license is about to expire, or has indeed expired. The one main reason why you would want to use a child theme: If you modify a theme directly and it is updated, then your modifications WILL be lost. By using a child theme you will ensure that your modifications are preserved. Log in to your site's WordPress Administration, and go to Appearance > Themes. Click "Add New" and upload the qusq-pro-child.zip file. Next simply click "Activate" and both the Qusq Pro theme and Qusq Pro child theme will be active on your WordPress site. Now you're ready to customize away. Say that you want to add a PHP function to your theme. The fastest way would be to open the qusq-pro/functions.php file and put the function there... But that's not smart: The next time Qusq Pro is updated, your function will disappear (as the entire contents of the /qusq-pro/ folder are replaced upon an update. This WordPress theme uses Node.js, Bower and Gulp to make it easy to change, process and build the theme quickly. For basic modifications we strongly recommend to use the standard, "compiled", theme version by us and use a Child Theme to do all modifications rather than changing the theme files. In this way you keep your theme untouched and your changes update-safe. You can override all CSS styles instead of modifying the theme's generated style.css file and keep all changes in one place. Using you web browser's "Inspect Element" functionality will be of a great help. For code changes you can either override the theme templates (e.g. "header.php", "footer.php", "page.php") or override existing PHP functions in the "functions.php" file of the child theme by coping their definition from the parent theme. The smartest way to modify or add functionality is to use WordPress hooks for filters and actions. You can use "add_filter", "add_action" or "remove_filter" and "remove_action" functions add new code or remove unnecessary functionality from the theme. Again all remains update-safe as everything is separated from the parent theme. If you really need to modify the original theme files and accept the fact that your changes will not be update-safe and you will have to re-produce all changes every time you update the theme then go ahead with this guide. We strongly recommend re-thinking the changes and trying to use Child Theme instead. Once done, install Bower. It depends on Node.js and npm. When all dependencies and plugins are installed without errors you can use the defaultgulp tasks to build the template into the dist folder and run file watchers. Now you can start modifying all theme files. The theme was built over Underscores (_S) starter theme provided by WordPress.org, so if you are familiar with it you already know what to expect. All the code & necessary files are located inside /src folder which is also the final destination of the generated files. All CSS files are written using SCSS. They are located inside /src/scss/ and processed and compressed into a single "style.css" file in the root of the /src folder. You may notice a few PHP and regular CSS files. Those are used for dynamic CSS generation based on the Customizer settings or are directly included via WordPress's "wp_enqueue_style" function on a specific place. The standard WordPress template files can be found in the root of /src folder as well as in /src/templates nad /src/template-parts with a self-explanatory titles. The main php functionality is located in /src/inc folder. You can also find a theme specific modules here which all add a special functionality to the theme in a very modular way so each feature can be easily disabled or re-enabled. The standard language file containing all strings from the theme can be found inside the /src/languages folder. You can use Poedit application to load this file and translate all strings into the language you prefer. This is the standard way of translating any theme, plugin or WordPress itself. Once done you need to save it using your language's abbreviations e.g. "de_DE" or "it_IT" and use the saved ".PO" and ".MO" files to be uploaded to you WordPress server.